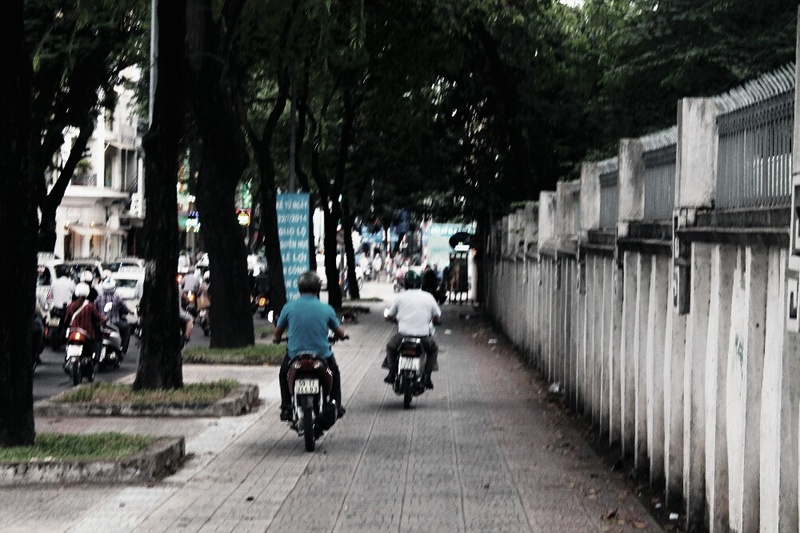 HCMC was way bigger than either of us expected for some reason. We arrived overland from Phnom Penh Cambodia. The bus ride all in all was okay, no complaints. It was a bit funny though crossing the border. They made us get on and off the bus at two points and walk across the border. It really made us feel like illegal aliens…except for the fact that we didn’t have to hide and sneak across and we already had our visa permission from the Vietnamese government to enter the country. 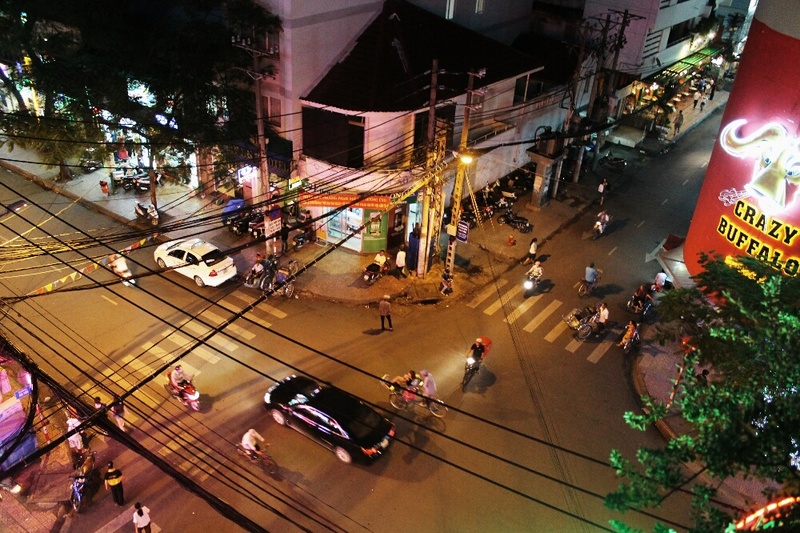 Our guesthouse was located just around the corner from one of the backpacker streets in District 1. We were glad to be staying off that main strip because those areas are usually hectic and filled with hawkers selling knock off goods. It’s sort of like the markets, once you’ve seen one, that’s enough to fill your boots. And yet, you always go see what they’re all about. You have to get used to hawkers hassling you to buy their goods. You might be eating lunch enjoying some of Vietnam’s finest cheapest beer with your knock ray bans on your face and they’ll still be trying to sell you one more pair. ‘No, I already have some’ doesn’t work to get rid of them. After living in Seattle for nearly 5 years, I like many Seattleites have developed a strange addiction to Pho – a Vietnamese noodle soup that I swear cures hangovers, rainy day blues and whatever other excuse you can think of to eat this delicious dish. Since moving to England, I have only dreamt of Pho and occasionally, if I’m lucky, on a trip to Bristol or London I might just get my fix. Obviously first things first in Vietnam, a bowl of the good stuff. I scoured the Internet for a place to get vegetarian Pho. I picked a place and we ordered. I was salivating while we sat there patiently waiting. Pho arrived and to my horror, I see shredded pieces of who knows what kind of meat. My best guess, pork. How utterly disappointing. The language barrier has failed me yet again. Later Stephen did some research of the dish we ordered and concluded that the mystery meat was likely shredded pig knuckles. Who the hell even knew pigs actually had knuckles anyway!?! Please don’t fret our dear reader, I’ve gotten more than my fair share of Pho since and will continue to do so until the day we leave this beautiful country. 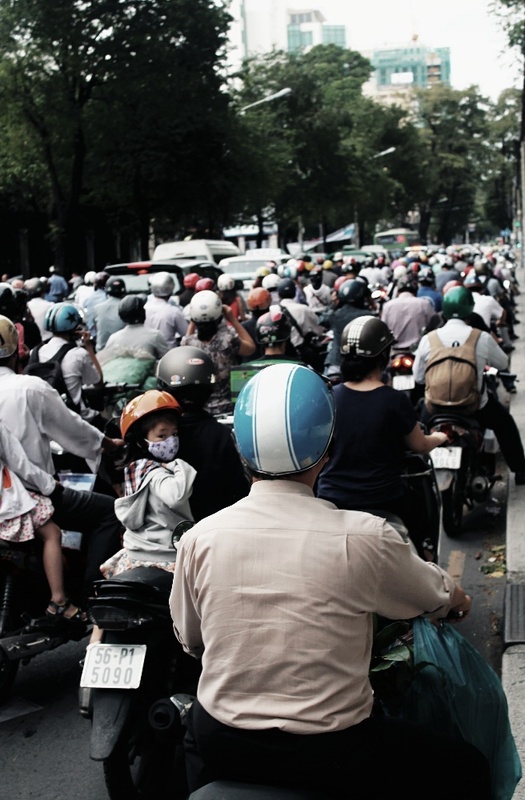 HCMC is filled, I mean filled with mopeds. Maybe that’s what the ‘M’ in HCMC really stands for. It’s unreal and unlike any place we’ve seen as hard as that is for even us to believe. They amass at stop lights, ride along sidewalks and criss cross simultaneously at every intersection. It’s a game of death each time you cross the road. Even when you get to a crossing with a green man indicating it’s safe to cross doesn’t mean you’re safe. Stephen found that out when he nearly got flattened by a bus. Amazingly it all somehow works, you rarely see accidents. 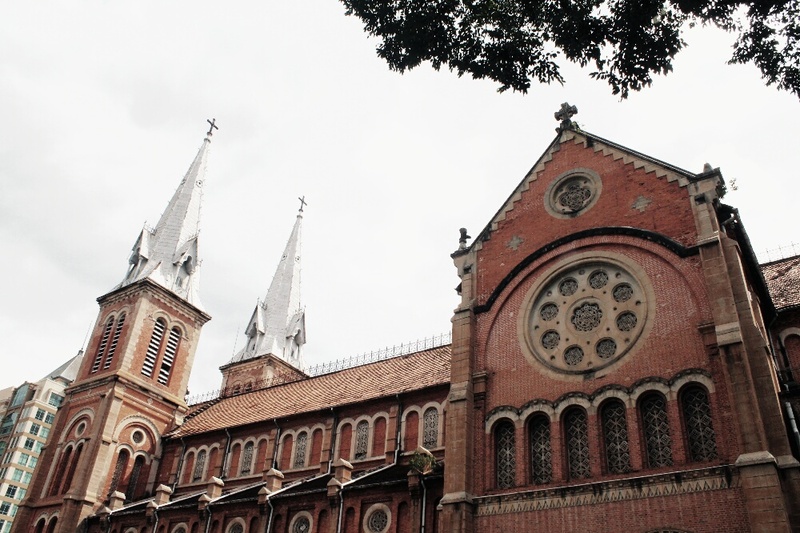 There are several churches throughout HCMC. 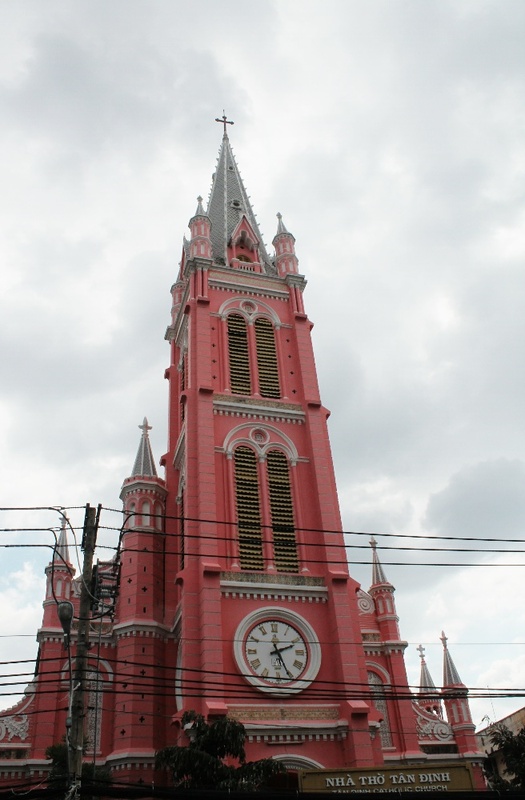 There’s a pink one and one that resembles Notre Dame. After seeing the real Notre Dame in Paris, I wouldn’t really say the one in HCMC is as impressive, but a walk by is well worth it. After that, we meandered through the city streets. 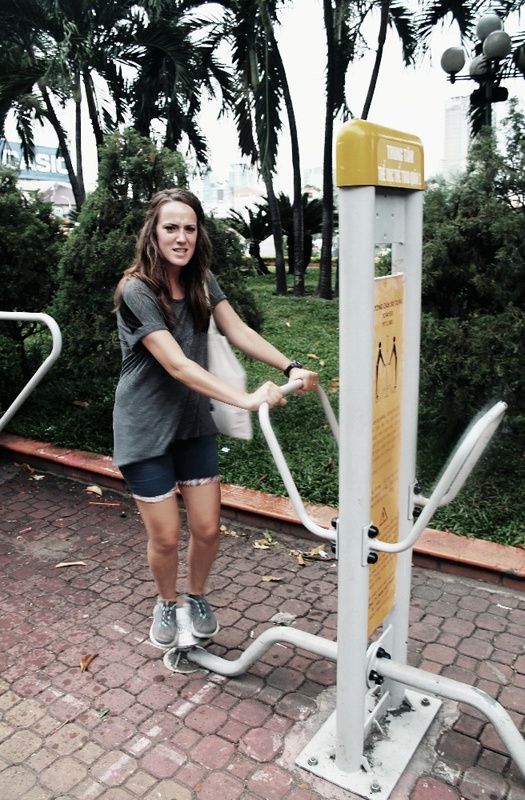 We came across a little fitness area in a city centre park. I love pretty much anything that’s free so we had a quick go. For me, no city trip is complete without hunting for second hand goods. 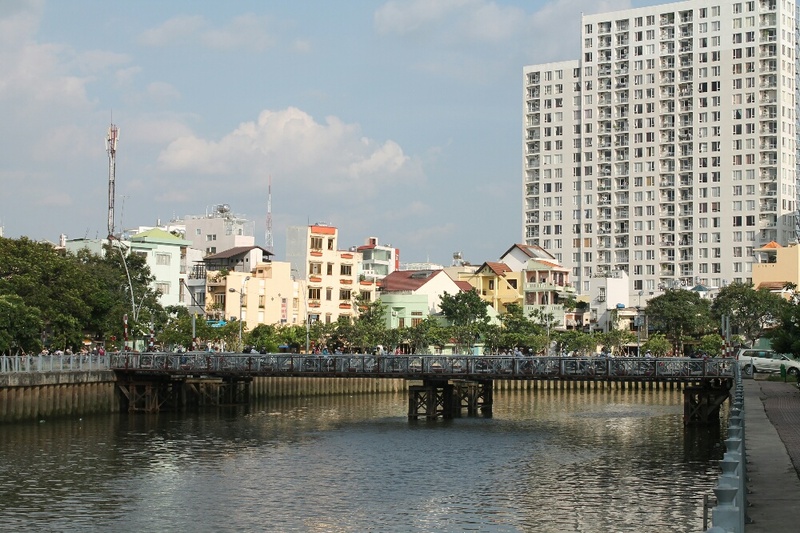 We walked along the lovely Saigon River which offers pristine views of the city. 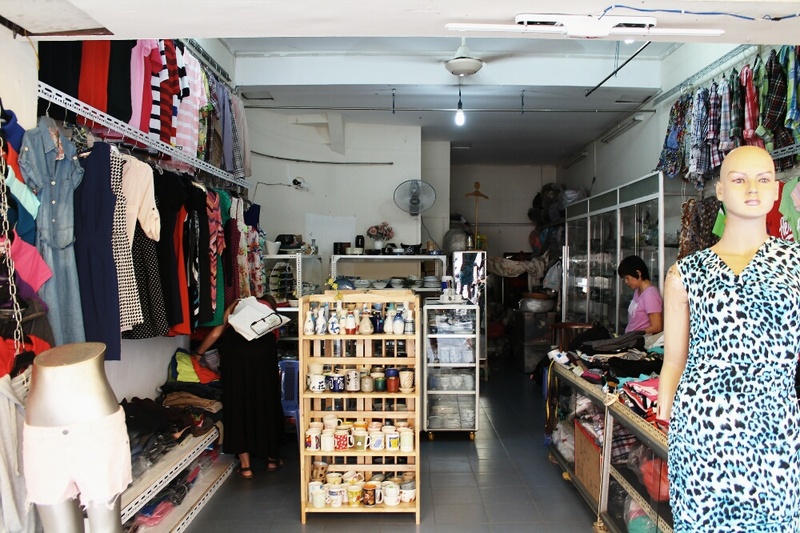 I lost confidence while we were walking forever to hit the jackpot area of second hand shopping in HCMC and ended up giving up. I did get a chance to scratch that itch however and found a couple nice shops the following day. 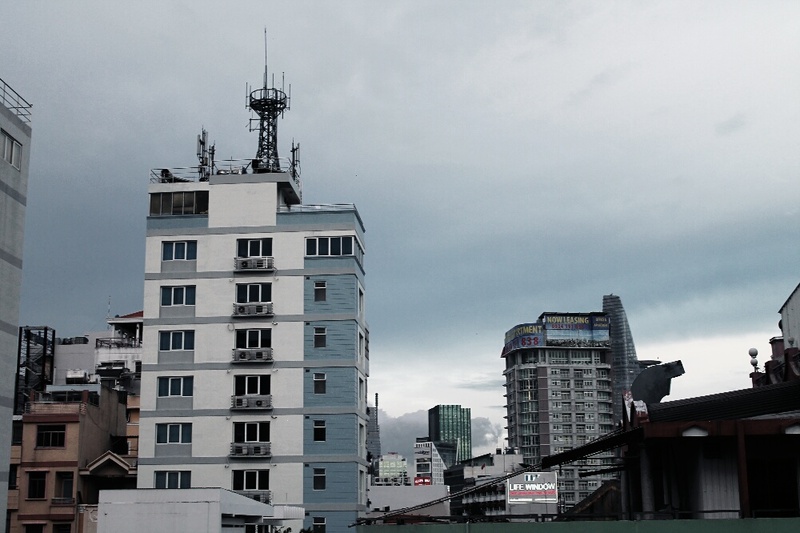 One in particular was just around the corner from Bui Vien Street in District 1 (225 Dē Thám Street). The shop owner was so sweet. She’s owned the shop for nearly 10 years and has about 10 employees. She was very complimentary to me (maybe working me, maybe not). I bought two dresses from her and really enjoyed the experience. Her shop was stacked high, but with a lot of variety, different from the typical repeat pieces you see over and over again in the markets and other storefronts. My kind of place. Okay, now to the more serious side of Vietnam. 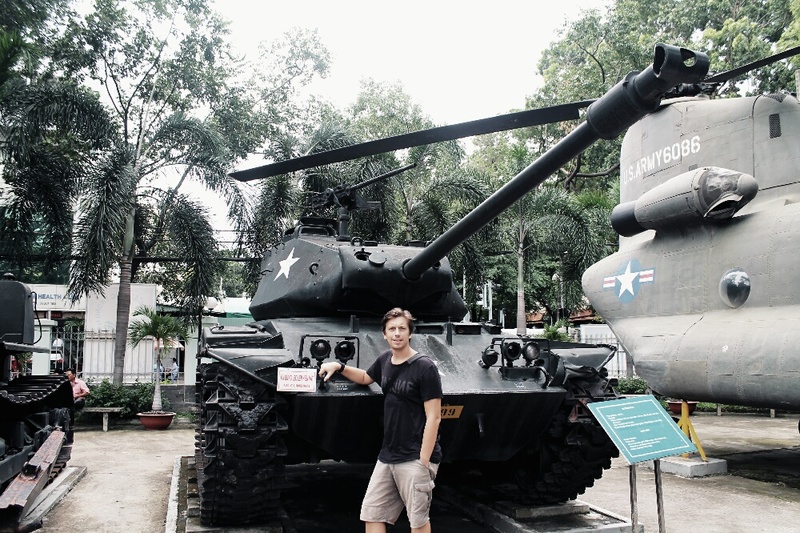 The Vietnam War with America was fairly recent when you think about it. 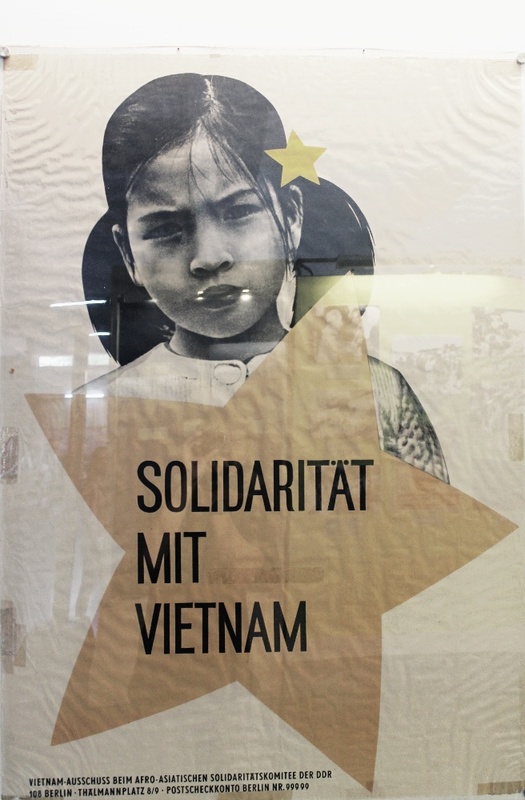 It was a controversial war and although the Vietnamese won the war, they suffered the most in death, injury and overall residual effects from the years the Americans were present in their country. 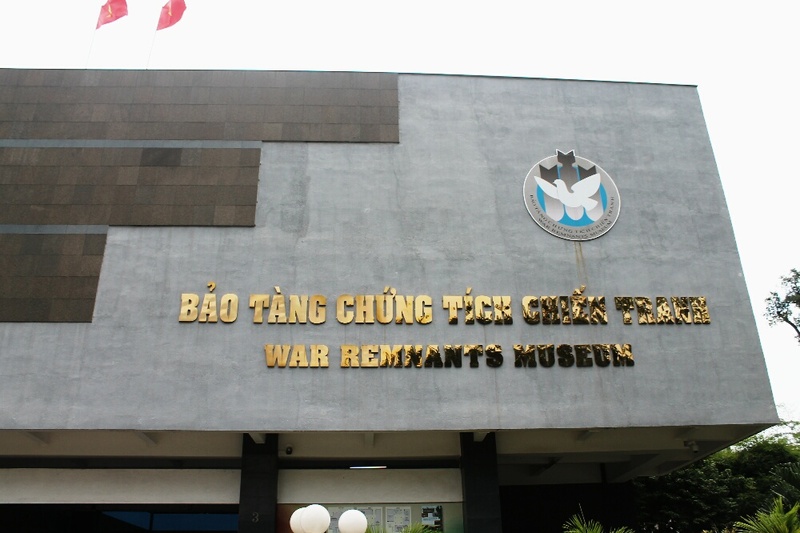 We visited the War Remnants Museum in HCMC which was shocking, educational and downright sad. The amount of damage done to the people and the land is astronomical and is seeing damage to this day. The museum is primarily filled with photographs and information about the damage done and what today (and probably then) would be considered war crimes. One of the saddest parts of the whole walk through were the many many pictures and stories of people who developed illnesses, injury and who are still born today with disabilities because of the chemicals (namely Agent Orange) dropped on innocent civilians throughout the country. There were a few stories of American children born with disabilities as a result of the chemical use as well. One US family received a several million dollar payout after suing the companies who supplied the chemicals because of the multi generational damage done within their family. I suppose that’s good for them, but how many Vietnamese families have received even a penny for their suffering? There were several pictures of people from across the globe protesting the war. I knew of the protests taking place in America, but I never put much thought to protests held in countries throughout the world. If it weren’t obvious enough, I think we would have joined in the protest marches against the war if we were alive back then. We left there feeling humbled and a bit sad. It wasn’t exactly a moment when I felt like a proud American. 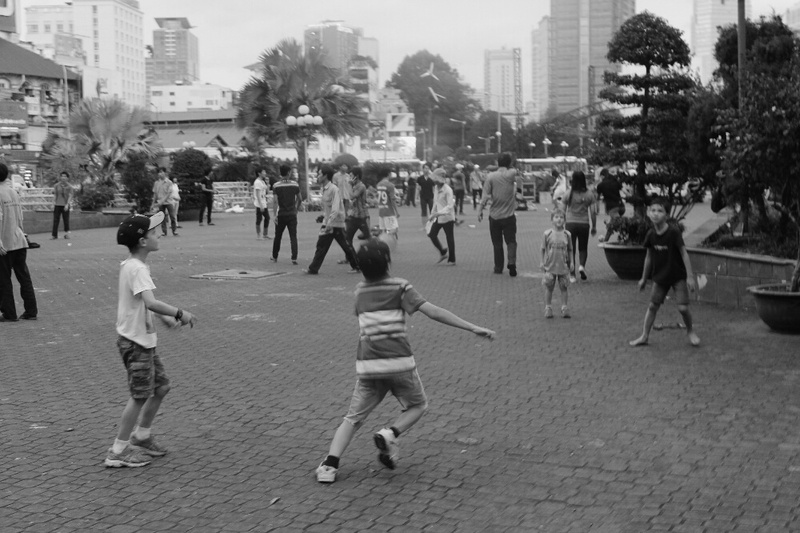 That said, the Vietnamese people that I’ve had the pleasure of meeting, so far, seem to be fond of Americans. I’m thankful for that. We can’t wait to see what the rest of the country has in store for us. 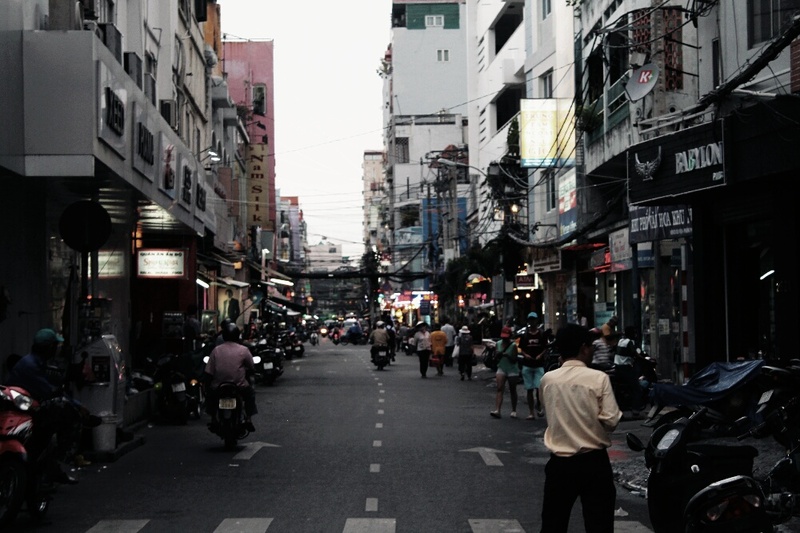 Posted on September 28, 2014 September 28, 2014 by themussmarter	This entry was posted in General MussMart News, Vietnam and tagged #moped, agent orange, backpacking, hcmc, hoichi Minh city, moped city, pho, saigon, travelling, Vietnam, Vietnam war. Bookmark the permalink.